This hat seems perfect to take us through autumn into the winter season whether we are hiking a mountain trail or dashing to the office or grocery store. The wool I chose is the soft and plump Barrett Wool Co. Home Worsted. 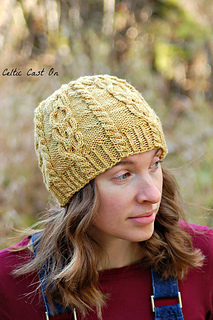 It works wonderfully to make the cables really stand out and creates defined twisted stitches along the brim. This hat is a cable lovers dream. The cables begin in the brim and continue throughout the pattern. 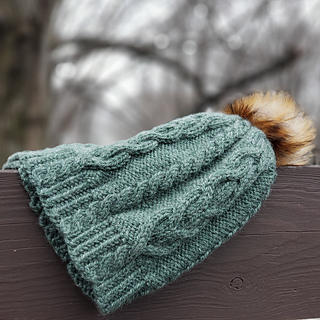 The hat is finished with a gorgeous faux fur pompom. The one I used is also from Barrett Wool Co. Their pompoms have snaps, so you can easily remove for washing your hat or to simply change the look by choosing a pompom of a different color. Of course, if pompoms are not your thing, the hat looks great without one, too. The pattern has been tested and tech edited. The instructions are both written and charted. 1 skein of Barrett Wool Co Home Worsted, (100% wool, 230 yds / 210 m per 100 g skein) or 200 yds / 183 m of worsted weight wool. Shown in Tattersall. 4 mm (US 6) circular needles or size needed for correct gauge. A beginning of round marker, 4 other markers, a tapestry needle, and optional pompom. 24 sts and 28 rounds per 4” / 10 cm in pattern after blocking. Brim circumference 18” / 46 cm unstretched.